“Je me réjouis quand on me dit: Allons dans la maison du Seigneur” (Ps. 122, 1). “How beautiful is Thy dwelling-place, O Eternal!”Psalms 84:1 My soul soars towards Thee, and my heart bounds with joy as I approach Thy sanctuary. “Happy are they who dwell in Thy house and sing Thy praise!”Psalms 84:4 Happy the man who seeks his salvation in Thee, O Eternal Shield of Israel. C’est en prononçant ces paroles de l’Écriture que j’ose, Seigneur, venir dans ce lieu saint, t’adresser humblement ma prière, à toi, mon Dieu, mon protecteur et mon sauveur. Uttering these words, I venture, O Lord, in this holy place, humbly to address my prayer to Thee, my God, my Saviour, and Protector. Dieu tout-puissant, si l’univers entier est ton temple; si le monde que tu as créé est l’autel où resplendit ta gloire, c’est dans le cœur de l’homme que tu as de préférence élevé le sanctuaire où tu veux être adoré par une prière sainte et pure. Omnipotent God! The universe is Thy temple, the world Thou hast created is the altar where Thy glory shines; yet in the heart of man Thou hast placed a sanctuary, wherein Thou wouldst be adored with pure and holy prayer. Mais c’est surtout aux descendants des patriarches, aux serviteurs du Dieu UN à faire retentir tes louanges, à proclamer ta grandeur. But above all, it is for us, the descendants of the patriarchs, the servants of the one God, to resound Thy praise and proclaim Thy glory. Seigneur, accorde-moi un cœur pur et pénètre-le de ton esprit, pour qu’aucune pensée mondaine ne puisse me poursuivre jusqu’en ce lieu sacré. C’est dans ton temple que je dois me souvenir qu’une âme droite est la meilleure des offrandes, et le repentir, la plus efficace des prières. Pénètre-moi, pénètre tous mes frères ici réunis, des sentiments de ta grandeur et de notre humilité, afin que nos têtes se courbent devant ta majesté, et que, de la profondeur de nos cœurs saintement recueillis, noire prière, comme un encens divin, s’élève vers ton trône céleste. Amen. Grant me, O Lord, a pure heart filled with Thy spirit, so that no worldly thought may follow me into this sacred place. In Thy temple must I remember that an upright soul is the best offering, and repentance the most efficient prayer. Fill my mind, and the minds of my brethren here assembled, with the knowledge of Thy greatness, and our littleness, so that we may bend in fitting humility before Thee; and grant that our prayers may ascend, as incense, from the depths of our hearts towards Thy heavenly throne. Amen. This is a faithful transcription of a teḥinah (supplicatory prayer) composed in parallel to the prayer for entering a synagogue, Mah Tovu, following in the paraliturgical tradition of Yiddish tkhines, albeit written in French. (This particular paraliturgical prayer may be original or it may be based on an earlier work in German or Yiddish. Please contact us or comment below if you can identify it.) 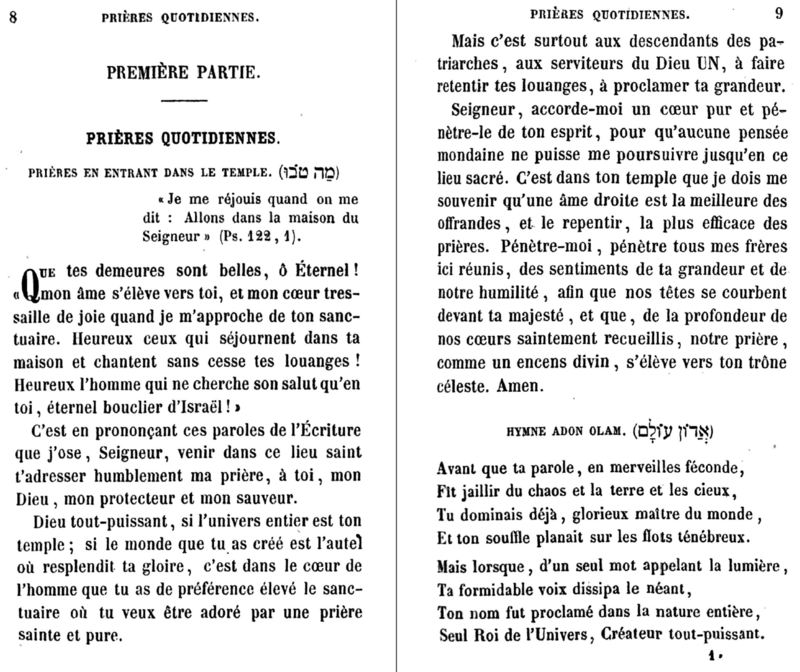 The prayer was included by Rabbi Arnaud Aron and Jonas Ennery in their opus, אמרי לב Prières d’un Coeur Israelite published in 1848 by the Société Consistoriale de Bons Livres. In 1855, an abridged English translation of Prières d’un Coeur Israelite was authorized by Nathan Marcus Adler, chief rabbi of the British Empire and published as Prayers and Mediatations, translated by Hester Rothschild. This is the first time the translation and its source have been set next to each other. This transcription was made possible with the help of French Wikisource contributors. If you can read French, you can help to complete our transcription by proofreading it on Wikisource. “מה טבו | A Paraliturgical Mah Tovu in French by R’ Arnaud Aron and Jonas Ennery (1848), translated to English by Hester Rothschild (1855)” is shared by Aharon N. Varady (transcription) with a Creative Commons Attribution-ShareAlike 4.0 International copyleft license. 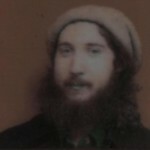 Please reciprocate for any adaptation or redistribution of this work by (1) properly attributing the work to Aharon N. Varady (transcription), Jonas Ennery, Hester Rothschild (translation), Arnaud Aron and Wikisource Contributors (proofreading), (2) clearly indicating the date you accessed the resource and whether any changes have been made (and if so, please be in touch with us and leave a comment below so that we might note your adaptation or improvement), (3) providing a link back to this source, and (4) specifying the Creative Commons Attribution-ShareAlike (CC BY-SA) 4.0 International copyleft license under which this work was shared.